If you have been following me, you know that I have been attending the Do It Herself Workshops at Home Depot. Last month, I actually built my own project! 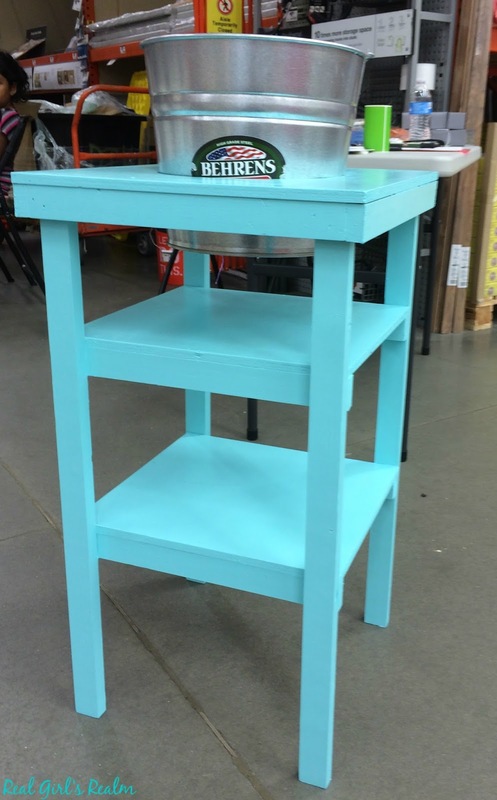 When I saw they were making a beverage cart, I had to take advantage of this chance to build my own, since I have had one of these on my summer wish list. 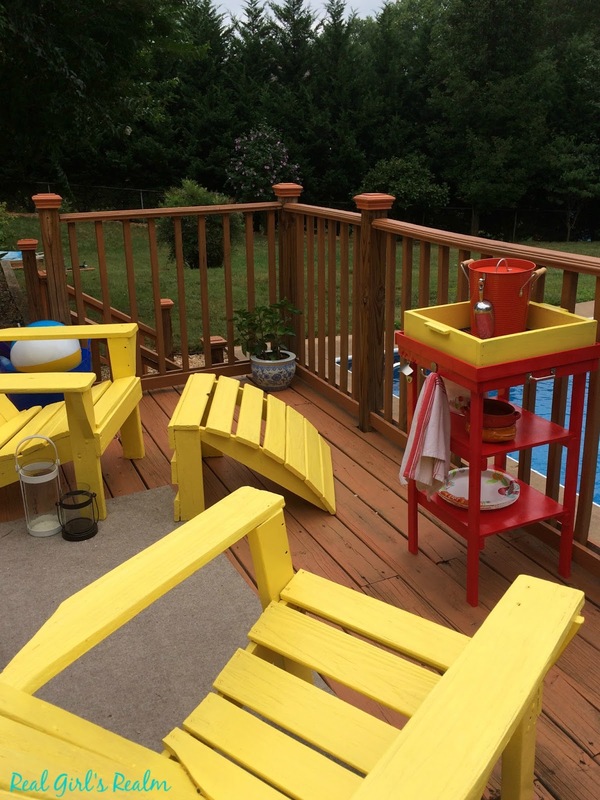 This project cost was about $15 dollars in materials, which was just the wood. 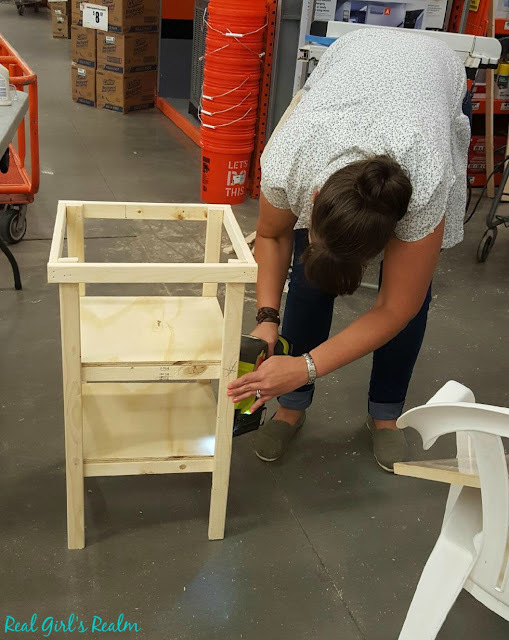 We used the tools and nails at Home depot and I chose not to cut the hole in my cart for the ice bucket, so I will be leaving that part out of my instructions. Step 2: Cut the boards and sand the rough edges. 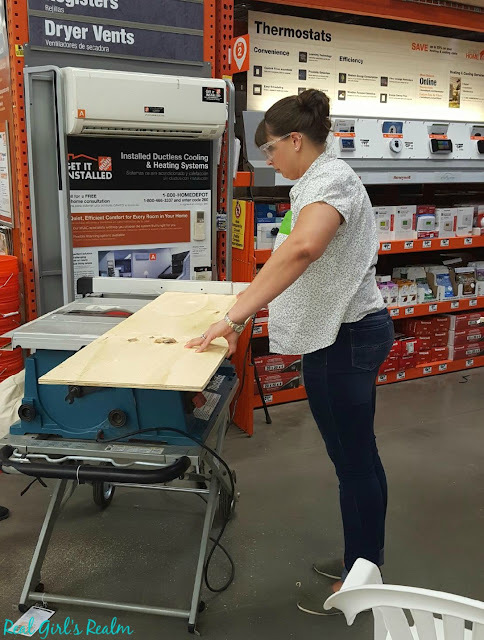 We used the table saw to cut our plywood and a jig saw to cut the leg and frame boards, but I would have used a chop saw if I would have been at home. Step 3: Paint or stain your pieces. Since we were making our project at the store, we did not do this step. I painted my finished piece afterward. 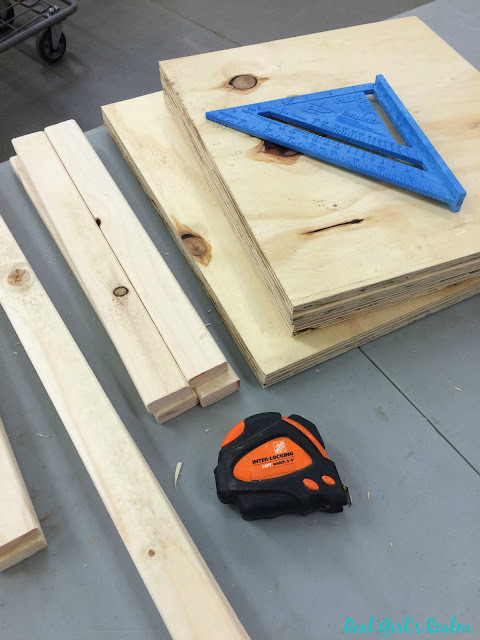 Step 4: Create the top shelf frame. Sandwich (2) 16" long boards between (2) 14 1/2" boards to create a square frame and secure with brad nailer. Step 5: Create Leg frames. Lay (2) 28 1/2" legs parallel and measure/mark 7 1/2" and 17 1/2" up from the bottom. Attach (2) of the 14 1/2" shelf braces with brad nailer where you made the marks. Repeat process with the other (2) legs and shelf braces. Step 6: Assemble beverage station. Place frame (from step 4) on flat surface and insert leg frames upside down into frame with shelf braces facing inward, keeping it flush to the top and corners (it helps to have a friend hold the legs!) Secure with brad nailer. Step 7: Turn cart right-side up and lay the (2) 14" shelves on the braces and secure with brad nailer. Step 8: Place the 16" piece on the top frame and secure with brad nailer. This project was one of the more ambitious ones we have done, because of all of the cuts, but once we started assembling the pieces, it went fairly quickly. You can easily customize this project by changing the dimensions, adding wheels, tiling the top...the possibilities are endless! 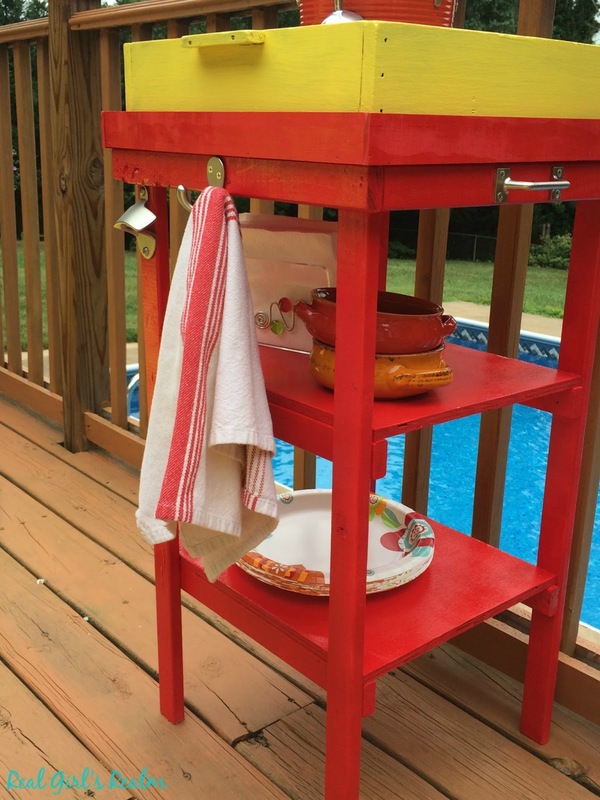 I painted mine red to match my iron side table on the deck, mostly because I had some leftover spray paint. I then found a wooden tray with a mesh bottom at a flea market that was the perfect size to sit on top of the cart. I once again went into my paint closet and found the leftover sun yellow from my Adirondack chairs and painted it yellow for contrast with the red. I then added handles so we could easily move it, a double hook, and a bottle opener (which totaled about $15) to make it the perfect outdoor serving station. 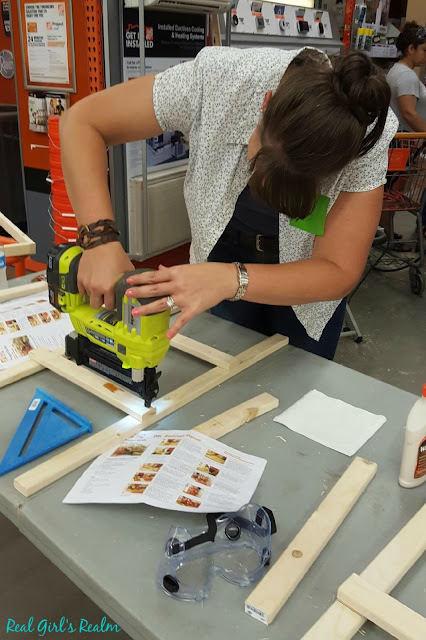 Home Depot also has Kids Workshops and Do it Yourself Workshops, where you can learn skills such as tiling, installing a light fixture, and garden maintenance. Check your local store for their schedule. If you have attended a Do it Herself Workshop at Home Depot, please tag me in you picture on social media or send it to me in an email. I would love to see it! What a cute project! I didn't know Home Depot did these! I need to look into this! Laura, You should! They make something different each month and its a fun night out! So clever! You always motivate me to go to one of these Home Depot things! I swear one of these times I will. I just wish you were closer so we could go together! You should try one anyway, but if you lived close, we would go to all of them together! Yours turned out so great! Fun night! Thanks! I can't wait till we can go again!